On August 21st 2017 a total solar eclipse occurred, and at Space Robotics, we had to do something about it. To help those in the USA enjoy it, and to approach it to anyone elsewhere, we built the 2017 Total Solar Eclipse App. 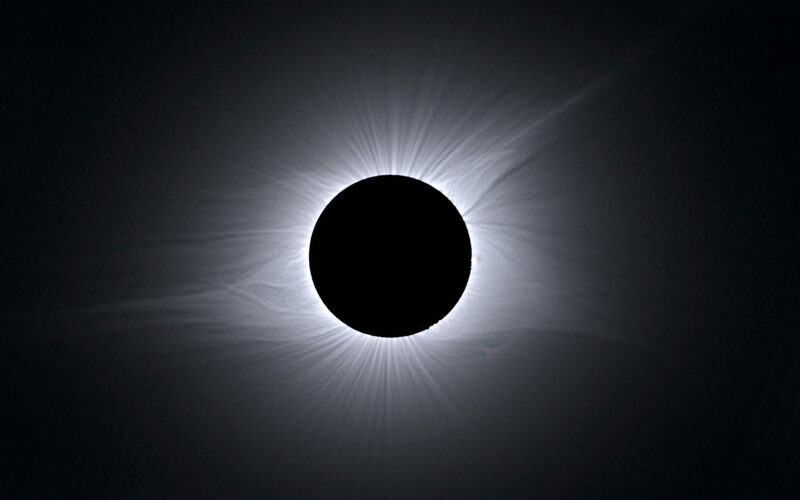 A total solar eclipse seen from the Earth is an astronomical event that occurs when the Moon is placed between the Sun and Earth blocking the whole Sun disk from the Earth’s point of view. This is really an extraordinary event. Moon’s orbit is tilted when compared to Earth’s, so solar eclipses are usually not possible because the Sun, the Earth and the Moon aren’t usually in the same plane, thus its impossible for them to be aligned. Only during brief periods of Earth’s orbit these planes come together, and only then, there’s a chance for an eclipse. Even if the planes come together when the three celestial bodies align, we might not be able to see a total eclipse. The distance between the Earth and the Moon changes periodically, sometimes it’s closer and sometimes further away, that’s why some days the Moon appears to be bigger. If during the eclipse, the Moon is not located close enough to the Earth, me Moon apparent size won’t be big enough to fully block the Sun disk, and the eclipse wouldn’t be total. A total solar eclipse is definitely something extraordinary, and when something like this happens, we might as well enjoy it. To help those in the USA to follow the eclipse and to approach it to anyone elsewhere, we built the 2017 Total Solar Eclipse App. The Sun as seen by ESA’s SOHO (SOlar and Heliospheric Observatory). SOHO is a space-based observatory that since 1995 has been viewing and investigating the Sun from its deep core, through its outer atmosphere, out to a distance ten times beyond the Earth’s orbit. This channel is updated each time a new image arrives to the SOHO on-line database, and it allows users to see in multiple wavelengths what is going on in the Sun before, during and after the eclipse. 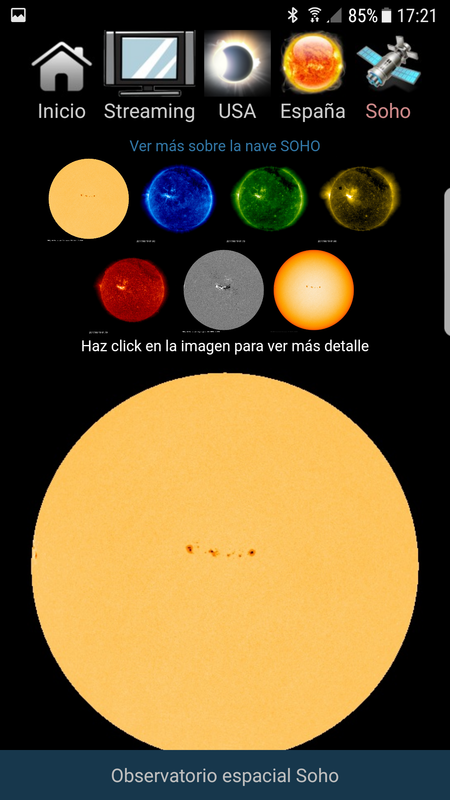 The Sun as seen from Spain. Thanks to ESA’s CESAR project, ESAC at Madrid has a Solar Observatory full-time dedicated to education. Images taken by this observatory are available online and are usually updated every minute. Through this channel, users may check how is the Sun seen from a point in Earth where the eclipse is not visible. 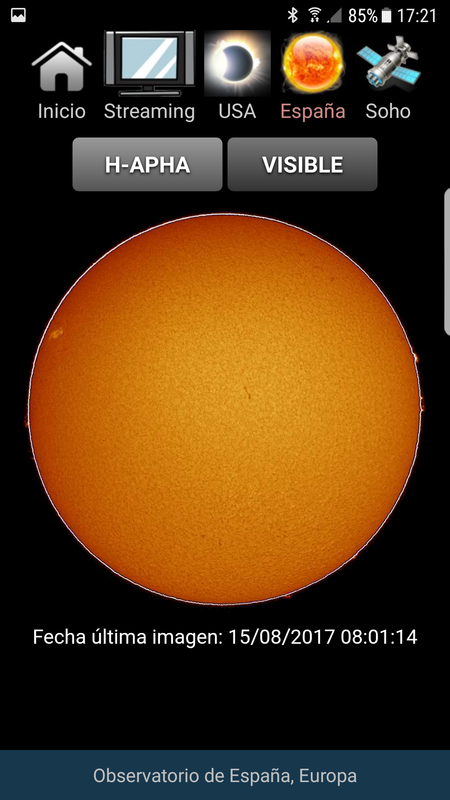 The Sun as seen from the USA. This channel was directly connected with our colleagues at the USA, who were constantly uploading life images from the eclipse. This is the App’s main resource, it approached the eclipse to hundreds of persons that were whiling to see it. CESAR streaming. Last but not least, the CESAR streaming channel was connected to CESAR’s room at ESAC, where a sun-related conference was taking place before, during and after the eclipse. Trough this channel users could learn new interesting facts about the Sun while waiting for the eclipse to come.